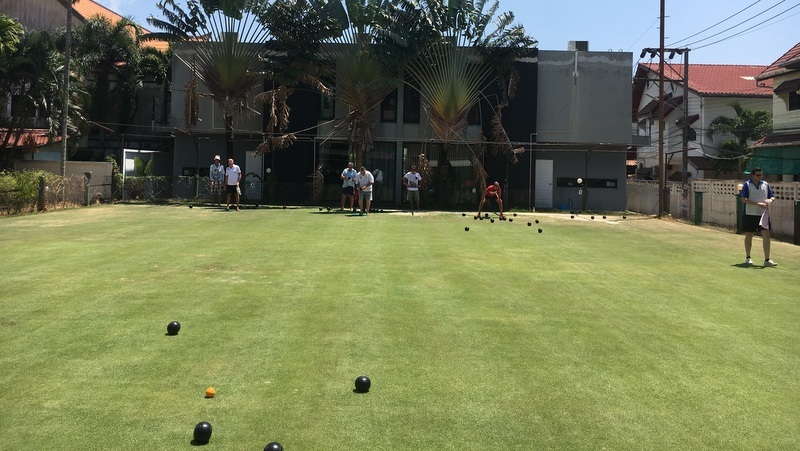 BOWLS: The final ‘major’ competition of the bowls high season took place at Kamala Lawn Bowls Club in Saturday’s searing heat – The Champions League Pairs (Mar 9). Champions Dean (left) and Rob (right) with the trophy and gold medals. 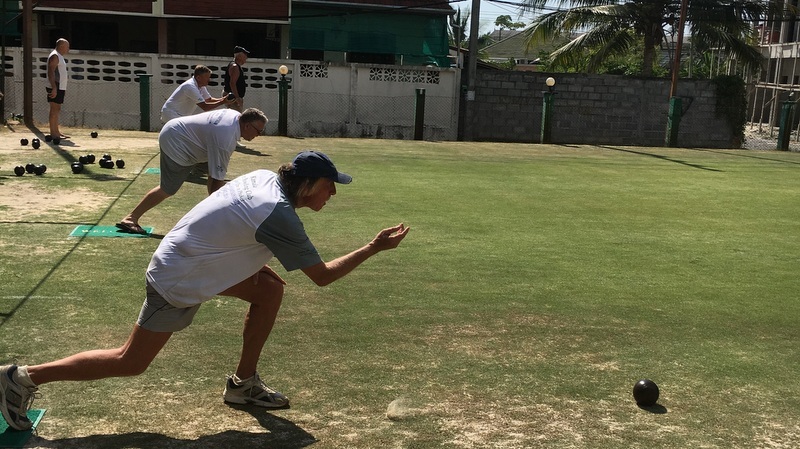 Action at the Champions League Pairs competition on Saturday (Mar 9) at the Kamala Lawn Bowls Club. 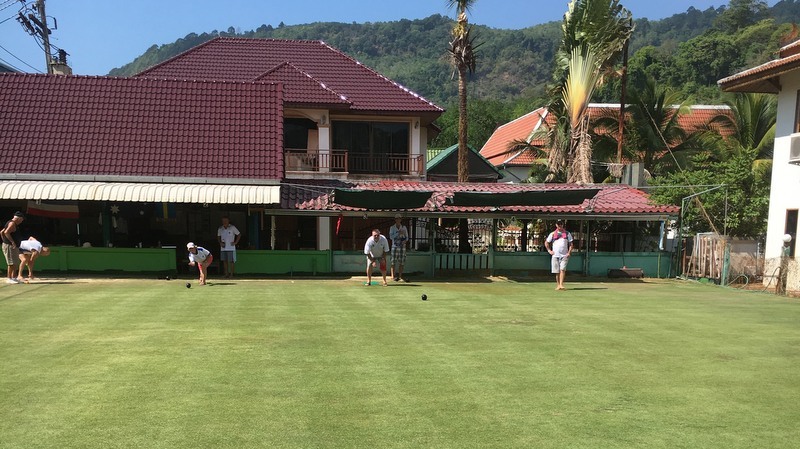 16 bowlers entered, which threw up some interesting pairings, but clear favourites were previous singles champions Dot Barker and Ulf (Ue) Egerstaad. The competition format was based on the UEFA Champions League. Two round robin divisions with the winners of each group facing the second place team of the other division in a semifinal knockout. The draw for the divisions created a wide open division A, whilst division B looked on paper to be a tough one. With two points being awarded for a win and one point for a draw, it was important for teams to note that in the event of a tie on points in a group, bowl (goal) difference could decide the final league places. 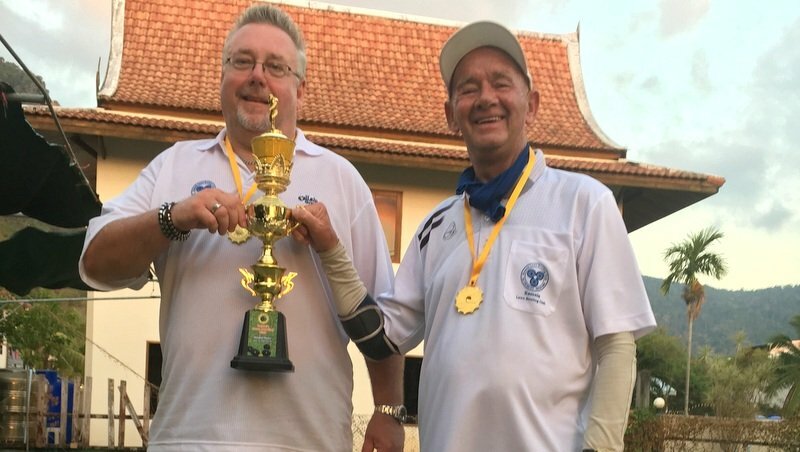 In group A the clear winners, being undefeated and claiming the maximum six points, were recent Phuket Open singles winner Peter Kuschel and Guy Winter. Claiming second in the group were indoor bowls specialist Gary Raby who is jetting off soon to compete for Spain in the World Indoor Bowls Championship, and Steve Merrel. Group B was a much tighter affair. With Dean Simmonds and Rob Knight beating Dot and Ue, and Ron Blackwood and Ulf Larsson subsequently beating Rob and Dean, a lot depended on the result of the final group stage game between Dot and Ue, and Ron and Ulf. Dean and Rob were aware that in the event of Dot and Ue beating Ron and Ulf, bowl difference could ultimately become crucial and they not only had to win their final game against George Sasanow and Kenta Lindberg but by a convincing margin, as going into the final set, they trailed Dot and Ue by two bowls, and Ron and Ulf by 3. Dean and Rob set about their business by whitewashing George and Kenta 15-0 leaving the other two pairs knowing that a win would probably see them through, although even for them, bowl difference could also play a part. As it turned out, the calculators were not needed as Ron and Ulf continued their fine form on the day by upsetting the pre-tournament favourites Dot and Ue 13-3, and finishing their league campaign undefeated, claiming the maximum six points. Dot and Ue ended the tournament in 3rd. So the semi final knockout line ups were Ron and Ulf versus Gary and Steve, and Guy and Peter faced Dean and Rob. Ron and Ulf continued their fine form by beating Gary and Steve 10-2 whilst in the other game Dean and Rob continued to improve and ran out comfortable 11-5 winners against Guy and Peter. The final pitted previous round robin opponents Ron and Ulf against Dean and Rob. Ironically Dean and Ulf had won the previous year’s Champions League pairs together, but this year having been drawn in different teams, only one of them would lift the trophy. In the round robin series Ron and Ulf had beaten Dean and Rob 8-7 and having comprehensively beaten all their other opponents, were supremely confident of picking up the trophy. Dean and Rob had other ideas and set off with a master plan of long jack selection and strategically placed bowls in covering positions. Ron and Ulf took the first end by two points but what followed was a steady accumulation of points by Dean and Rob, and with three ends to go, Dean and Rob led by 11-3. Tactics then came to the fore with Dean and Rob limiting their losses and taking no risks, as recognised by the crowd, by playing some wonderful covering bowls. At the last end the score was 11-5 to Dean and Rob with Ron and Ulf needing a score of at least 6 points out of the available 8 to force an extra end. A tough ask, especially as Dean and Rob’s tactics up to now had been superbly astute. With Ron delivering two short bowls on the last end, that task was to prove even harder. Dean and Rob kept their composure while Ron and Ulf took four points from the last end which would be insufficient for a win, and they subsequently won the match 11-9. Dean retained his Champions League pairs title, whilst Ron and Ulf were left perplexed as to how they had been tactically outwitted. In the bronze medal match, Gary and Steve were comfortable 17-5 winners against Guy and Peter. The next competition is the end of season Winners Takes All scroungers friendly on April 9. All are welcome to enter.